While ENFPs are often viewed as outgoing and truly extroverted people, this is often just what is seen on the surface. People who spend time with them might actually start to doubt that they extroverts at all. Each personality type possess both extroverted and introverted qualities, since being fully one way is not healthy. While some might be extroverts, that doesn’t mean they don’t have traits that strongly lean in the opposite direction. ENFPs can actually be the more introverted of the extroverted types, often surprising people with their tendencies and behaviors. ENFPs actually need a lot of space and independence, or else they feel smothered. Sometimes they want to go off on their own and just dive into some sort of new hobby. This can appear like a more introverted qualities, especially since they can take it to the extreme sometimes. ENFPs don’t like being controlled or held down, and truly enjoy doing things on their own. If someone is smothering them it can be extremely draining and they will likely try to get away from this person. In these situations the ENFP would actually prefer to be alone, rather than be around people who drained them and hold them back. They don’t require constant interaction, especially if it is going to leave them feeling drained. ENFPs might appear rather outgoing and social around others, but they do enjoy time to themselves. For the ENFP time alone means they can spend time inside of their own minds. They enjoy thinking about different possibilities, and sometimes having others bugging them can just be annoying. They sometimes spend hours just thinking about different things and during this time they don’t need to be interacting with people. ENFPs can actually be quiet when they are spending time inside of their own minds, and won’t be their usual chatty selves. When they are in this mood they will certainly appear much more like an introvert, which can throw some people off quite a bit. ENFPs can actually become drained by people, especially ones who are rude or shallow. Certain traits leave them feeling more emotionally drained than anything else. This is a quality often found in introverts, which can make it rather surprising that ENFPs share this as well. While they crave connections and interaction with people, it has to be something meaningful and interesting. ENFPs don’t like being bored by mindless chatter, and actually find this very draining. Most people can push their buttons in some ways, and so ENFPs can appear more introverted sometimes because of it. 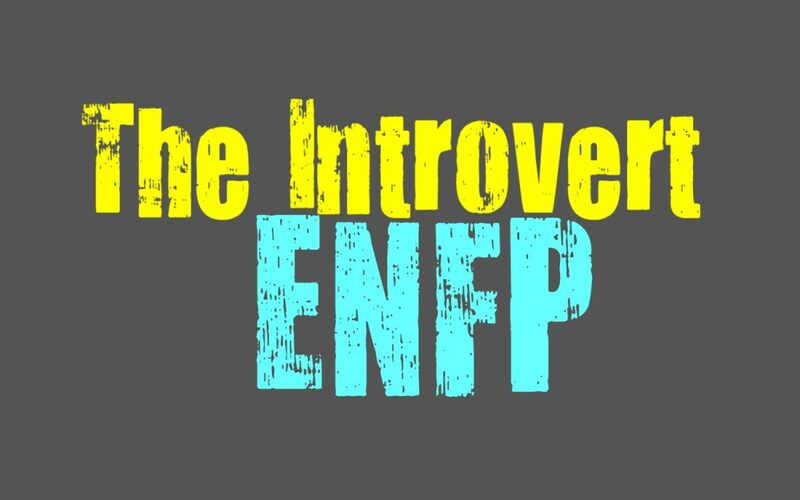 There are times when the ENFP goes through avoiding interacting entirely, and this can definitely make them appear like introverts. They will spend a lot of time inside, not wanting to go out and face others. This often happens when certain functions are presenting themselves more, and makes the ENFP appear very introverted. They don’t want to interact with people, and don’t want to bother getting off the couch. They might spend hours playing video games, watching movies, or just daydreaming. People might assume there is something wrong with the ENFP when this happens, but in truth they are just going through a phase in their lives where they need to be inside of their own minds. Eventually living this way will cause the ENFP to feel stagnant, and so they will require some sort of change and new activity to dive into. It is often natural for them to go back and forth, between trying new things and simply wanting to be away from the world. They can become a bit cynical and just don’t have the external energy to spend around others or out in the world. While ENFPs do enjoy connecting with others, meaningless chatter is exhausting. They can sometimes completely ignore someone who just chats about shallow things. ENFPs sometimes struggle to really hide when they are agitated by someone, and so they won’t find it natural to pretend. When the ENFP is around someone who only talks about shallow and pointless subjects, they will want to get away from them. While they value conversation, it needs to be something deep and meaningful or it simply won’t do. ENFPs don’t enjoy entering into discussions that bore them, and they can become bored rather easily. For them it isn’t worth wasting their time or emotional energy, and will definitely leave them feeling drained. This is similar to how introverts are drained by too much social interaction, and can make them appear much more introverted. ENFPs also don’t always require direct interaction, since it is their functions which make them extroverts. Their extraverted intuition deals with patterns and new ideas, and so they need to bounce these thoughts off of others. Sometimes this just means discussing these patterns and ideas with people over internet forums or through texting. It doesn’t always require being in someone’s presence, and ENFPs can gain just as much by just chatting on the internet or phone. They simply need to find ways to build on their thoughts and imagination, and need to discuss it with someone who can help inspire more ideas. After they get what they need, the ENFP is perfectly happy spending some time alone thinking it all through and processing this information. Their desire to have space and spend time daydreaming, can definitely cause the ENFP to appear more introverted. While they desire connections and close bonds, this doesn’t mean they need constant interaction. They want to feel close to someone, but this can happen even if they are physical separated. ENFPs just need to feel like someone cares, and when they have a lot of ideas they want someone they can share them with.